Buzz Blog: Podcast: Which Way to Mercury? Podcast: Which Way to Mercury? Mercury has a big month coming up, with the 40th anniversary of Mariner 10's final flyby on March 16th and the planned conclusion of the MESSENGER mission a couple of weeks later. To date, these are the only two spacecraft to have visited the innermost planet in our solar system, largely because it's fiendishly difficult to get there and operate in orbit so close to the Sun. Nevertheless, Mercury remains an exciting destination for planetary exploration, holding clues to the formation of our solar system and providing a link to exoplanets orbiting near to their own stars. An artist's impression of the MESSENGER spacecraft in orbit around Mercury. Another probe will soon join this elite group, but even though the launch is scheduled for late 2016, the European Space Agency's BepiColumbo spacecraft won't arrive at Mercury until 2024 (at the earliest). To understand why, we speak with David Rothery, UK Lead Scientist for the Mercury Imaging X-Ray Spectrometer, one of the instruments that will be carried onboard. As Rothery points out, the main problem is speed. "To get to Mercury, you're falling toward the Sun, so you're accelerating all the time." The discovery of the gravity assist maneuver in the early 1960s opened up the possibility that some of this excess orbital energy could be lost in a gravitational interaction with Venus. The spacecraft could be slowed down and redirected to Mercury using this "slingshot" mechanism, which is now a common feature of mission planning. In 1970, an Italian astronautical engineer named Giuseppe (or Bepi) Columbo - the namesake for ESA's upcoming mission - pointed out that multiple flybys of Mercury could be achieved by putting the vehicle into an orbit around the Sun timed to be exactly twice as long as Mercury's orbital period, a circumstance called a 2:1 orbital resonance. Mariner 10 did exactly that, passing by Mercury three times in 1974 and 1975. 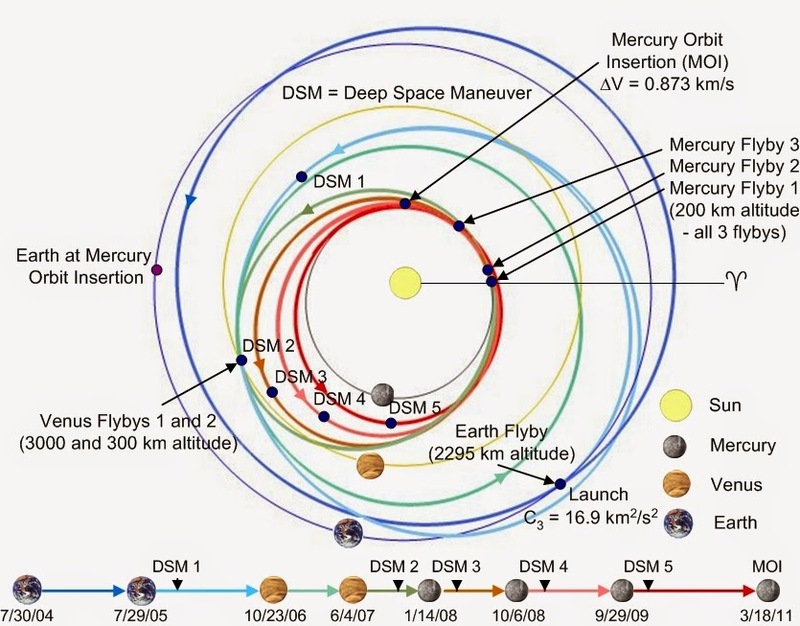 MESSENGER's complex flight plan shows the numerous gravity assists needed for a successful orbit. A decade later, another innovation in trajectory design got both NASA and ESA interested in sending missions to orbit the planet. Chen-wan Yen, an engineer at the Jet Propulsion Laboratory, suggested that multiple encounters with Mercury could be used to slow down the spacecraft little by little, until the difference in velocity becomes small enough that the spacecraft can leave its orbit around the Sun and revolve around Mercury instead. 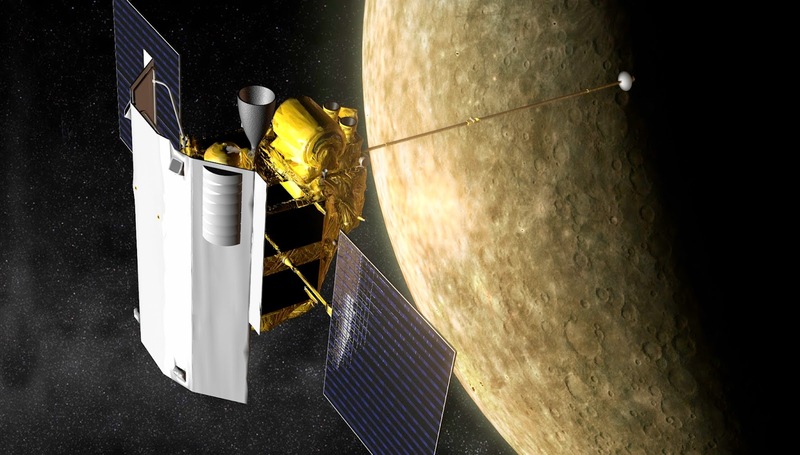 This plan worked for NASA's MESSENGER mission, which launched in 2004 and achieved orbit seven years later, after two Venus flybys and three passes at Mercury. According to ESA Mission Analyst Rüdiger Jehn, BepiColumbo will follow a similar trajectory, with slight differences owing to the fact that this time, the spacecraft will be using an ion propulsion system to slow itself down en route. Jehn's role will be mostly complete once BepiColumbo drops into Mercury orbit, but that doesn't mean that orbiting the first rock from the Sun is easy. As MESSENGER demonstrated, Mercury's neighborhood is a tough place to hang around, with gravitational perturbations pushing you closer to the planet over time, and intense heat from both the Sun and the hot planet below making it difficult to keep electronics cool. The road to Mercury has been long and winding, but not without reward. Rothery, Jehn, and the whole BepiColumbo team are looking forward to getting off the ground, and soon they'll be able to say that third spacecraft has made it to Mercury. all the words in simple way every one should understand easily i-love-spam. Simply super comments are posted here babblein.. The information which you people are said here are really good ikzhibo.com..!! !